November 16, 2009 marks 10 years since Rae Carruth had his pregnant girlfriend Cherica Adams shot during a planned drive-by shooting as the two left a south Charlotte movie theater. Carruth was just 25 years old and was a promising wide receiver for the Carolina Panthers. Adams was 24, and even though she was riddled with bullets she managed to tell police that she believed her boyfriend had arranged the shooting, and she gave birth to a son, born 10 weeks premature. Adams died four weeks later. You can relive what took place that night in 1999, along with what followed a year later when the infamous "Rae Carruth Trial" got underway, and what has evolved over the past decade. In the cover story of this week's issue of Creative Loafing (Nov. 11-17), I chronicle Carruth's life behind bars, how he and Adam's son Chancellor is about to be 10 years old and is being raised by Adam's mother, and how so many lives were forever changed by such a senseless murder. 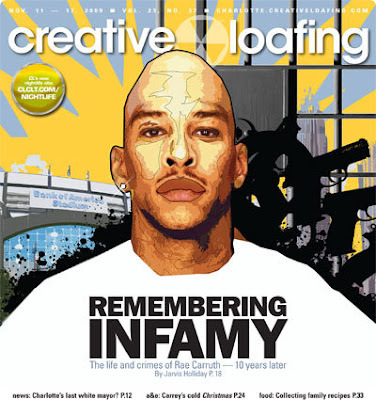 The issue of Creative Loafing is on newsstands now, or you can read the article online, "Remembering Infamy: The life and crimes of Rae Carruth — 10 years later." I was in college at USC in Columbia when the murder and subsequent trial took place. I remember watching the trial play out on CourtTV. The cable network would re-air the day's testimony at night. At times, it was more entertaining, suspenseful, and drama-filled than anything you might see fictionalized on Law and Order. Charlotte had become home to a media circus. But when I was researching and doing interviews for this article, I took on a whole new perspective of the events. I was reminded of the harsh realities that a young woman lost her life. That a young man lost his professional football career and freedom. That a child suffers from cerebral palsy from having been delivered too soon and now doesn't know either of his parents. Rae Carruth is a heartless person who deserves to spend the resting of his living days in jail. I feel as though if you're capable of masterminding a murder,you're also capable actually doing it.